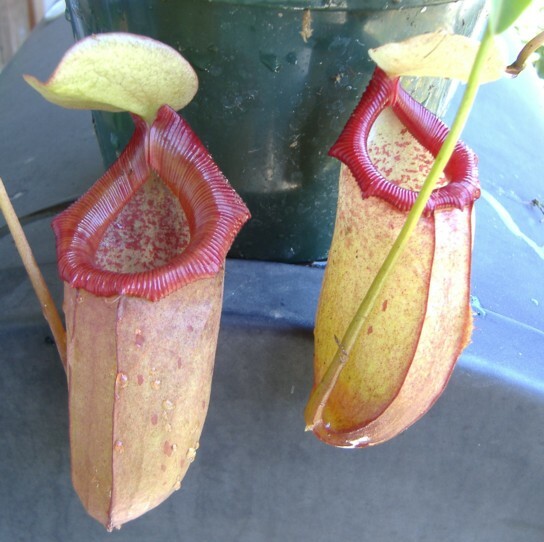 Nepenthes ventricosa X (talangensis X carunculata) is an Exotica Plants hybrid between two highlanders. I bought the plant because I thought the mix of the N. talangensis X carunculata could prove interesting. There weren't any photos of this hybrid but it was relatively inexpensive so I decided to give it a try. It looks like there's a little of all parents in this plant from the photo above. This is a new offering as of 2007 and there isn't a lot of photos of other growers' plants on the forums yet for comparison. Sometimes there's a lot of variation in complex hybrids and this hybrid may have some. I plan to grow it outdoors in a hanging pot with my other highlanders. I grow all of the parent plants easily so this hybrid should be no problem.